Gujarat has strong fundamentals - its entrepreneurial people, excellent infrastructure, stable governance, business friendly policies. Having successfully organized seven constructive summits, Government of Gujarat, as part of its journey towards sustainable long-term growth and inclusive development is organizing the 8th edition of the Vibrant Gujarat Global Summit from the 10th to 13th of January 2017 at Mahatma Mandir, Gandhinagar. The central focus of the Summit is “Sustainable Economic and Social Development”. The theme of VIBRANT GUJARAT GLOBAL SUMMIT 2017 will be: "Connecting India to the world". 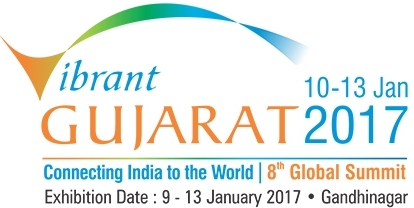 Hon'ble Prime Minister of India SHRI NARENDRA MODI will inaugurate and address VIBRANT GUJARAT GLOBAL SUMMIT 2017 on 10th January, 2017. In previous edition of summit there were 8 partners countries, but this time there will be 12 partner countries in Vibrant Gujarat Global Summit 2017. They are Australia, Canada, Denmark, France, Japan, Netherlands, Singapore, Sweden, UAE, UK and America. And also this time there will be 7 partner organizations supporting the Vibrant Gujarat Global Summit 2017. They are Australia India Business Council, Indo-Canada Chamber of Commerce, Japan External Trade Organization, UAE-India Business Council, UK-India Business Council, US India Business Council and British Council. Global CEO round table will have 25 CEOs from Fortune 500 companies across the world and equal number of top CEOs from India. A national level seminar on Goods and Service Tax (GST) will be held during the Vibrant summit. Nobel laureate exhibition to be opened by PM at Science City in Ahmedabad will remain open for visitors for five weeks. Vibrant Summit will also see seminar on ‘Make in Gujarat’ covering biotechnology, food processing, textiles, aerospace and defense, plastic, engineering, heavy engineering and automotive, chemicals and petrochemicals, pharma and medical equipment manufacturing. The summit will host three ‘Action Seminars’ in partnership with The Value Web and the topics for the three Action Seminars are ‘Smart and Livable Cities: Opportunities and Challenges’, ‘Innovation, Startups & Entrepreneurship’ and ‘Inclusive Growth(Agriculture & Rural Economy)’. Strengthen the foundation for Gujarat to become economically and socially the most developed state in India by 2030, at par with the best in the developing world. Leveraging Gujarat’s manufacturing leadership in the country and it’s economic strength, to connect the global investor with India and the state. Attract the brightest minds from across the world to ideate, showcase innovation and best practices, and discuss their application to the state and the nation. Empower India to compete with the best global economies. Provide a platform for global business networking.